Well Gangrel. What more to say than mysterious. 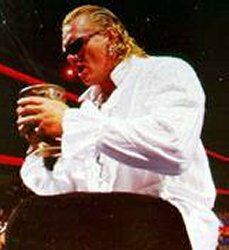 Help get the WWE to bring back Gangrel. Go to my petition @ http://www.petitiononline.com/g89356/petition.html and sign it. there is more info on the page. later. Gangrel did work for 2 years in the WWE. He did 2 shows for JCW(Juggalo Championshit Wrestling Insane Clown Posses Fed). Then he went to WWA(World Wrestling Allstars) and did work for them for about a year. Then he got fired on the European tour this summer and is now in California Wrestling Alliance. Gangrel has been fired from the WWA and did not complete the tour this summer. He now works for California Wrestling Alliance. Gangrel met with doctors last week who issued him with a full medical clearance to return to the ring. Gangrel has been on the shelf for several months due to him being plagued by a persistent neck injury, which has now finally cleared up. Gangrels consultation with doctors was a very positive one, and he left with a full bill of health and is once again at the creative teams disposal as regards his return to mainstream action inside the WWF. A new gimmick is being thrown around at creative meetings for him, but nothing is set in stone just yet. 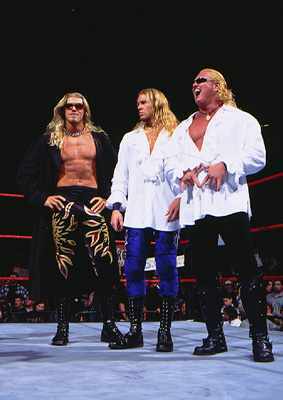 Gangrels official return to action within the WWF is yet to be determined. 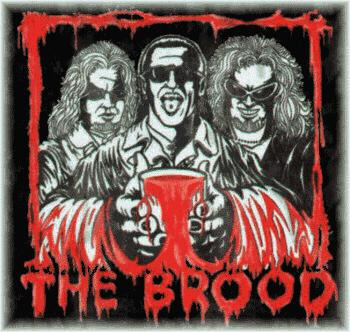 Here is a pic of the BROOD. Gangrel and any Gangrel content is property of White Wolf inc. Any copyright without permission Kyle MacDonald is prohibited. This is a very serious crime. Gangrel and any BROOD content is property of White Wolf inc.